A 4-in-1 Kicking Tee System for conventional and soccer style kicking. This kicking tee is four kicking tees in one. It is a one inch kickoff kicking tee as well as a ground level kickoff kicking tee. It is also a one inch and a 3/4 kicking block that can be used for extra point and field goal placement kicks. Up through the high school level, kickers are allowed to use a one or two inch elevated kickoff kicking tee. 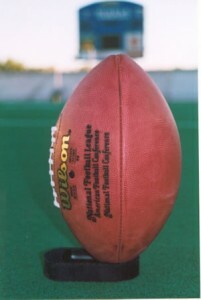 At the college and professional level, kickers use a one inch kickoff kicking tee. Young kickers should start with the two inch kickoff tee to take advantage of the higher elevation to get more lift on the football. Mode 2: When practicing with a holder, flip the tee so the Flat side is up and it?s a 1″ Kicking Block for placement kicks (Raised projections to make for a sure hold). Mode 3: In the orientation of Mode 1, insert the tee into the plastic base to create a 1″ kick off tee. Mode 4: In the orientation of mode 2, insert the tee into the base and it?s a 1-3/4″ Kicking block for placement kicks.